Virat Kohli is the happiest person right now. 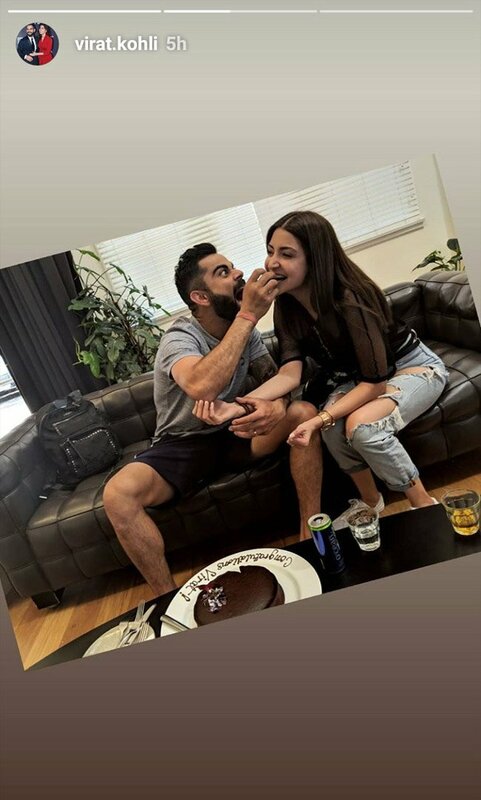 The historic win of 2-1 is one of Kohli's biggest achievements and Anushka is so proud of her hubby that she celebrated the milestone. The pictures of the two are already quite a hit on social media and they have become the talking point. Virat also shared a picture on Instagram. Ranveer Singh and Sara Ali Khan's film Simmba is a major hit! The current most popular actor of B-Town Vicky Kaushal is all pepped up for his upcoming movie Uri. According to media reports, Vicky was itching to be a part of an action movie, and while chatting with media, Vicky revealed the advice his father, director Sham Kaushal, gave to him before he started filming for Uri. Abhishek Bachchan and Aishwarya Rai are ideal husband wife! Ranveer Singh’s dance to Jumma Chumma is worth watching! Seems like Amitabh Bachchan’s superhit track Jumma Chumma from the film Hum is Ranveer Singh’s favourite song, and we say this because he danced on this song at Priyanka Chopra-Nick Jonas to Isha Ambani-Anand Piramal to his own wedding with Deepika Padukone. Now in his latest video, we again see him dancing atop the bar at the success bash of his film Simmba. Angad Bedi and Neha Dhupia are now parents to their beautiful daughter, Mehr Dhupia Bedi. Mehr means blessing and for both Angad and Neha, she is a true blessing indeed. Angad has been making sure that he supports Neha all the time, and for him, Mehr has been lucky and he has become more responsible. Neha and Angad's marriage took everyone by surprise, and then, the announcement of pregnancy was yet again a sweet surprise for the fans. Presently, they both are enjoying parenthood and taking care of the little princess.